I've long used and worked with Unix and Linix machines, while also being subjected, of course, to machines running a morass of pieces of software that have oozed forth from Bill Gates' pits of bloatware hell. Of course, Microsloth is responsible for more than just bloatware. It's responsible for the insecure, poorly configured software that distributes almost all of the world's computer viruses, worms, etc. 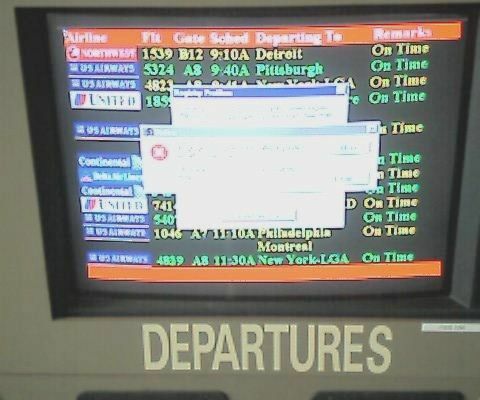 The more and more idiots put such servers into important tasks, the more we are all at risk, such as when a perfectly good portion of Southern California's air traffic control system running on Unix was replaced with wonky Windoze crap, after which a Microsoft server crash left 800 planes in the air without contact to air traffic control. A good article on web servers, "The Battle for the Web" was in The Age on 17 Feb 2004. It is interesting to compare the types of sites which use well-designed web server software with those which use IIS. The sites which you'd expect to have knowledgeable staff, with some input into major technology decisions, such as the Bureau of Meteorology, various universities, IMDB, the CIA, NASA, Encyclopaedia Brittanica, etc, all use Apache or Netscape/SunONE. The companies with a long history of making massive IT mistakes and of clueless management making uninformed IT decisions without even consulting the IT experts in their own structure, such as Telstra and Australia Post, use IIS. Coincidence?